Photoed yesterday, in Kings Cross. But, I don’t live in Kings Cross. This signs are one of the pleasures of London. As you can see, they are the work of these people. I like the ones which manage to be oddly titillating and completely incomprehensible at the same time, so that you will hopefully then buy the newspaper to find out precisely what they mean. London is one of the few cities in the world to still have an evening newspaper, probably because of the huge number of people who commute home on public transport, and this is a good thing. I do wonder if the Standard actually can survive the onset of the free sheets, though. 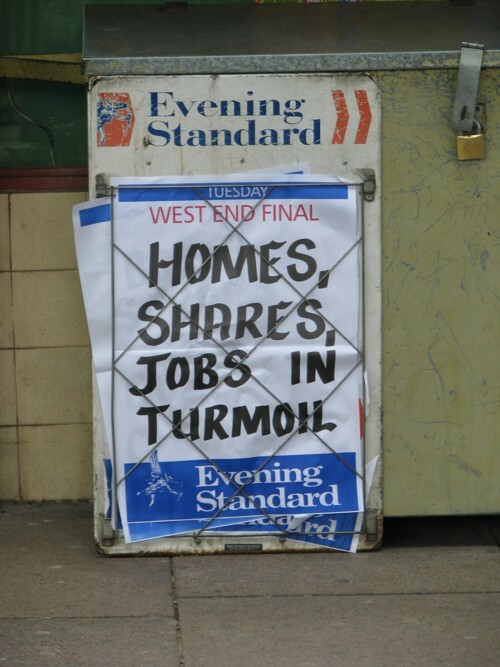 (Of course, two of London’s three main free sheets actually belong to the Standard, so the situation is fairly complex). I might complain less about the MSM if we had more journos in the USA like the guys who set up Mosley. Instead we get earnest, PC drones with no sense of humor. It was the great shame of US journalism that Eliot Spitzer’s secret life was revealed by the FBI rather than via NY Times video on YouTube.